What’s Up At Lake O’Neal? It certainly isn’t the water level. Since early September, this flooding has lost 2-3 feet of water. And for a lake that’s not so deep to begin with, that’s significant. 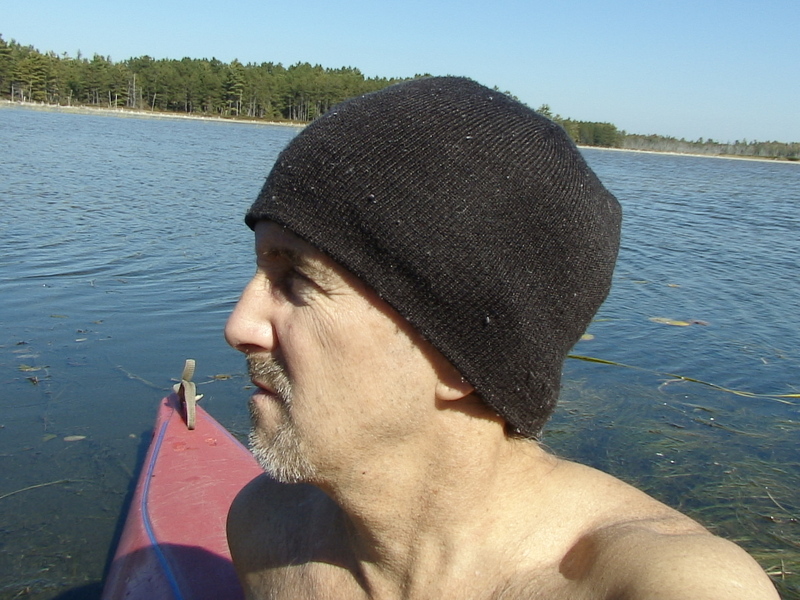 I paddled it in late September, just to make sure the loons had gone. They had. Or that there was enough surface area left for them to take off. There was. More than I’d expected, actually. Though most of it’s only inches deep, and the lake doesn’t have to lose much more to expose large tracts of lake bottom. A good sign is that spring water enters the lake from several sources. The bad thing is that that won’t continue in a drought, and if the DNR leaves the dam wide open for too long, the lake will quickly shrink. Loons will return, see their former territory drastically altered and leave. How do I know that? It’s exactly what happened on nearby Dingman Flooding about a decade ago. Leaving that marsh nearly dry for two years saw the resident loons off. And they never returned. It’s pretty hard to find fish to feed yourselves and your chicks in a nearly dry lake. 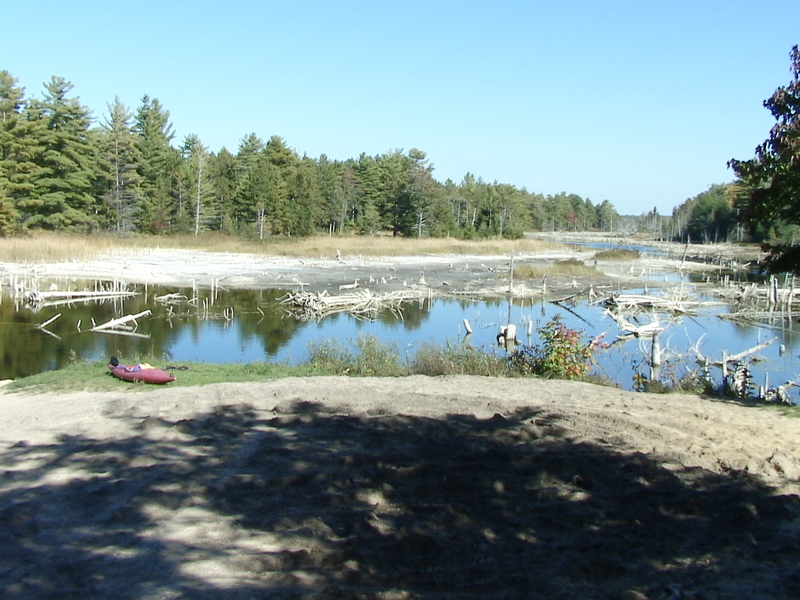 And, if you visit our LoonCorps site very much, you’ll know we can’t afford to lose any more nesting lakes. It’s one thing to lose a lake to something you can’t solve; it’s another when the solution is at hand and simply requires obvious action. Fix the dam. Structurally, it’s fine. Some erosion took place around it, and the lost soil needs replacing. Period. I’m told by several DNR officials that loons, designated a Threatened Species in Michigan, are an important consideration in decisions such as this. The question might be, does our legislature have the will to put as much importance on non-game species as they do game species? In other words, are they willing to spend what it takes to save Lake O’Neal? Even some environmentalists I know say get rid of all dams and return the stream back to its natural state. I say with fewer and fewer undeveloped, wildlife rich places such as O’Neal, can we afford to lose any more? For a more in-depth story on the status of O’Neal, and to get my friend Nicole Perry’s and other nearby residents’ views on this fixable disaster, click here to see the October 6 edition of the Petoskey News-Review written by Mark Johnson. See what the DNR has to say on the subject, and check out pictures courtesy of LoonCorps, taken during my visit last month. 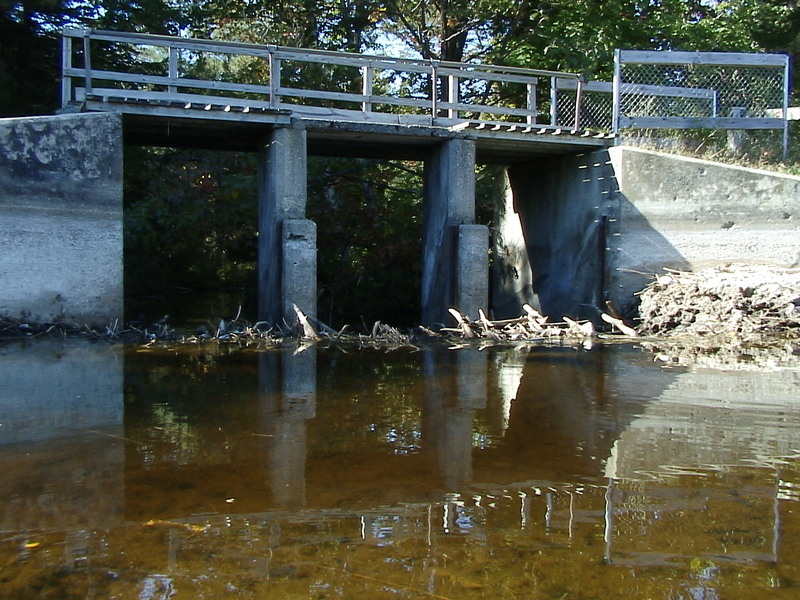 Posted by Jeff Lange on October 7, 2014 in Lake Profile and tagged Dam Failure, Jeff Lange, Lake O'Neal, Looncorps, Loons, Mark Johnson, Nicole Perry. Unacceptable…. One of the most beautiful, and untouched places left in Northern Mich. If they get away with letting it go, who knows what they will try next? Ycamp is what I’m thinking. I live there all summer. DISGUSTING DISASTER. Please help me fight it! Go to the Bliss town hall meetings. This place of tranquility must be restored! People need to get their heads out of the sand. I would love to speak with you. It was good to speak with you Sharon. This beautiful, undeveloped lake, with its rich wildlife, must not be left to die. I hope all hell breaks lose up there! It can’t be soon enough! What ever I can do! I have contacted your state governor. Funny how the DNR is allowed to break the laws protecting that area! Can you please do another story to refresh the publics’ memory on O’NEAL Lake?